Dismaland Bemusement Park was hyped from the beginning, more than any other project by any renowned artist in recent times. 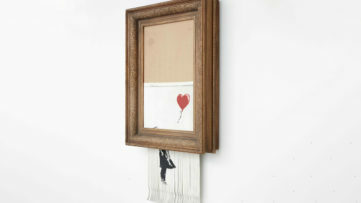 It is no wonder since Banksy is known for organizing some controversial and spectacular events in the past. The fans and the general public alike were eagerly awaiting to see how his biggest project to date turns out, ever since the first rumors started circling. However, now that Dismaland is open, the hopes and expectations seem to taper off. 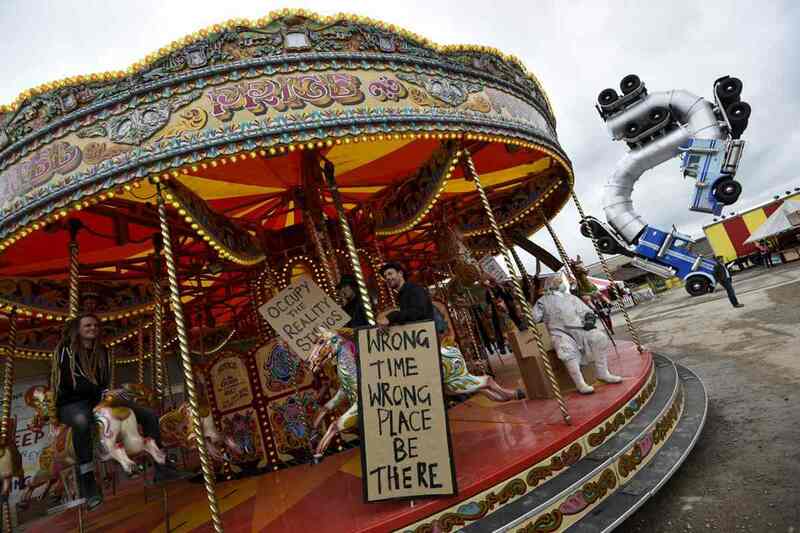 Announced as ingenious creation, for many visitors Dismaland turned out to be quite boring and unengaging experience. Or was that the whole point? 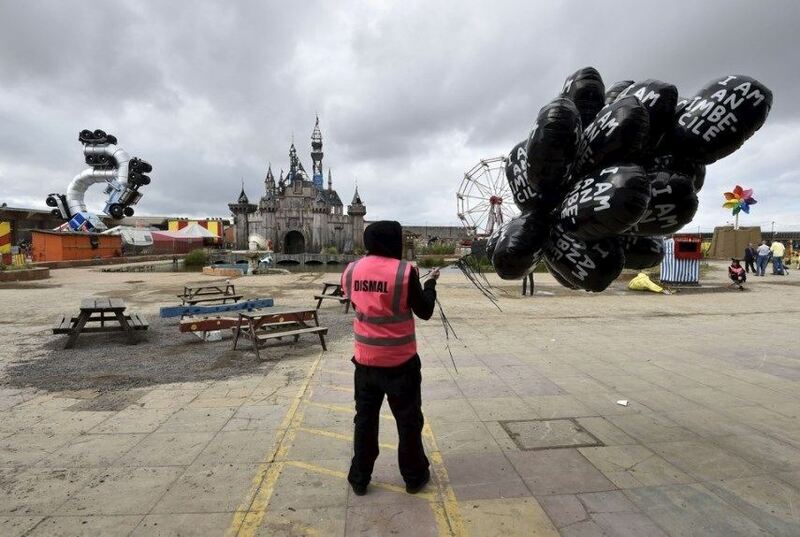 In the last couple of days, many started wondering if Dismaland was nothing but one big hoax? 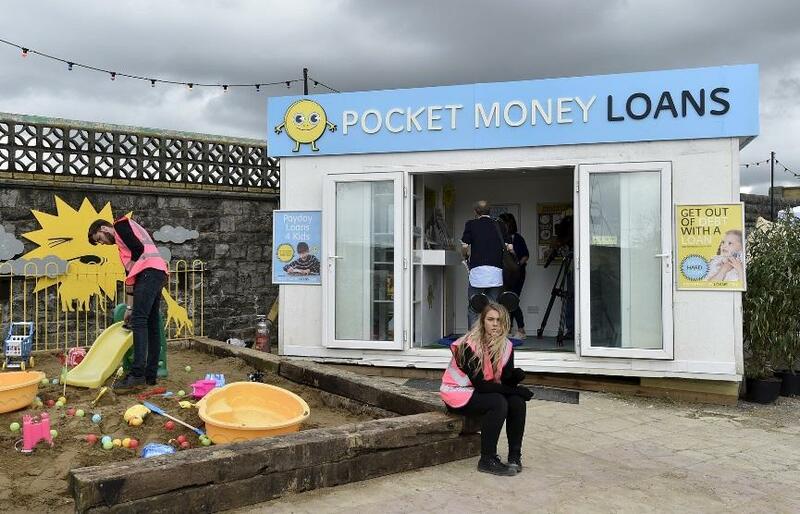 Some went even further to challenge its very existence, even though photos and videos from this recent installation at the Weston-super-Mare ground were all over internet. The main reason was, of course, the crashing of the official website and frustrating news that on the first day of wider public viewing the online tickets were unavailable to buy online. The website crash was the consequence of more than six million people trying to get their tickets at the same time. Frustrated fans were concerned that they might miss the chance to see Banksy’s monumental work, while many started wondering if this was purposely done, as part of the overall bemusing experience. Although amusing and convenient thought, the official apology doesn’t really support it. Reports of those who did succeed to enter the Bemusement Park differ immensely. The feelings were mixed and opinions divided, depending on the point of view. Many visitors seem to be genuinely disappointed, even bored. For some people, the park didn’t live up to the expectations while others perceived the disappointing experience as the whole point of the Disneyland parody. So who is interpreting the concept wrong? The often bad jokes, rude staff members, the proliferation of visually unappealing artworks and interactive installations which are all but user-friendly add up to the overall depressive and bleak setting of the Weston-super-Mare promenade. Those who were looking for the excitement of the amusement park got nothing of the sort. There were even those who brought children even though it was emphasized that is it not suitable for the youngsters. 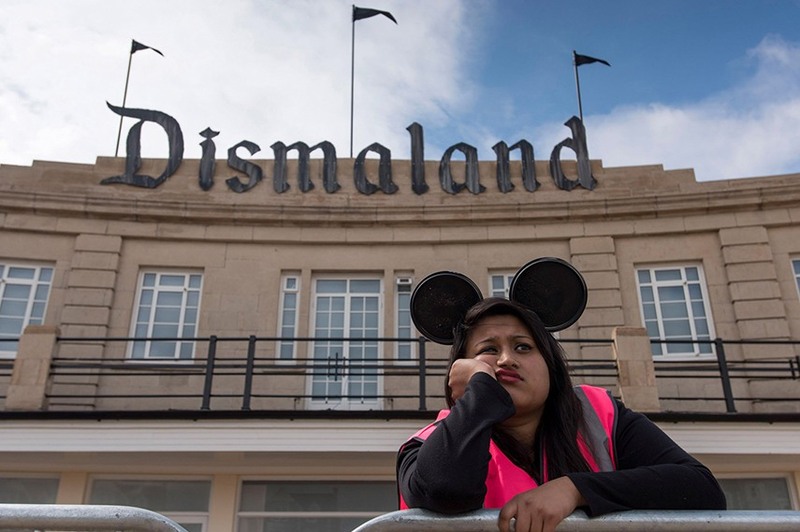 It seems as the only satisfied visitors were those who saw disappointment as part of the deal and agreed to see Dismaland as the satirical insight on the state of our mainstream culture. 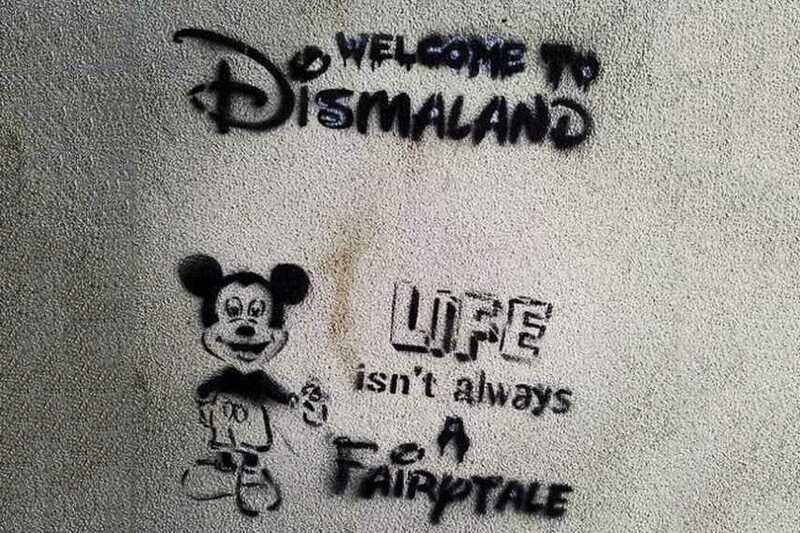 Who is an imbecile in Dismaland? 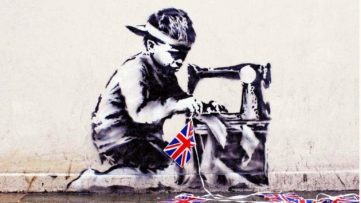 When asked about the idea and inspiration for Dismaland project Banksy stated that “it’s a theme park whose big theme is – theme parks should have bigger themes.” The obscure and cryptic statement can be read as a critique of the consumerism, society oriented towards spectacle, entertainment, careless about the big political and social issues of our age. At the beginning of the eighties French philosopher Jean Baudrillard wrote about Disneyland as one of the main examples of hyperreality a key concept in understanding contemporary cultural conditions. By presenting the imaginary as more realistic then the reality itself Disneyland draws visitors into the world of escapism and happiness achieved through simulation. Further on it makes the troubles of the real world less relatable. Whether Banksy read Baudrillard’s work or not, he certainly did a great job in creating the very opposite notion of the amusement park. Dystopian World Presented by Banksy – What Is the Real Message? By now it is clear that the only way Dismaland can be read is through the powerful political messages it sends. There is nothing joyful about the treatment of immigrants, economic hardships, death, and suffering. 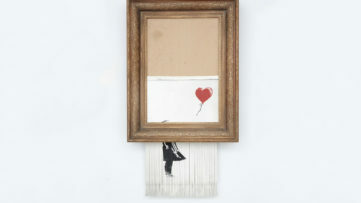 Banksy’s pop-up exhibition is a burst of reality in the most unsuitable form which makes it even more effective. Surely it is hopeless and depressive, but our social surroundings are not much different at all if we decide to take off our Disney glasses and take a real look at the world we live in. In the end, the message is opened to interpretation so make a visit to Dismaland, don’t bring your children and end-joy! Create your profile via My Widewalls and stay tuned for more reports on Dismaland and other new projects and events!